Must experiences: Take cablecar ride up to Victoria Peak for spectacular bird's eye view of Hong Kong and its bustling harbour. Ride the historic Star Ferry. Explore Hong Kong's energetic restaurants and shops. web pages for more tips. Must experiences: View the picturesque rice terraces. Attend the mesmerizing music and dance performances. Absorb Bali's arts & craft cultural scene. Experience Bali's temples and ceremonies. Must experiences: Visit the photogenic Royal Palace and the Temple of the Emerald Buddha. Must experience: Sail on a traditional boat in nearby Halong Bay to see a picturesque limestone-island landscape. Must experiences: Eat at a Singapore outdoor hawker food stall. Explore the Marina Bay Sands Hotel's mammoth grand floor lobby and its striking 57th floor garden and infinity pool. 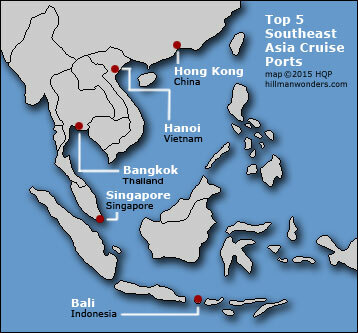 Ho Chi Minh City (Saigon) and Chan May (for taking excursions to Hue, DaNang, and Ho Ahn in Vietnam). Fly to Siem Reap in Cambodia to visit the great wonder Angkor Wat. I describe the Silver Wind luxury cruise ship on these 10 web pages.